After the reflective atmospheres of the first two works, Kangding Ray realizes a new album oriented more towards to the dance floor instead of an immersive listening; preferring a marked rhythmic like the techno – a kind of music not stranger for the French composer – to those subtle tonal and structural solutions to which many were accustomed after the first two albums, Stabil (2006) and Automne Fold (2008). In fact, Solens Arc seems to draw a perfect arc to link it with the previous Or (2011), of which retrieves the dark sonority, a preference for the rhythmic element and a more dynamic writing. 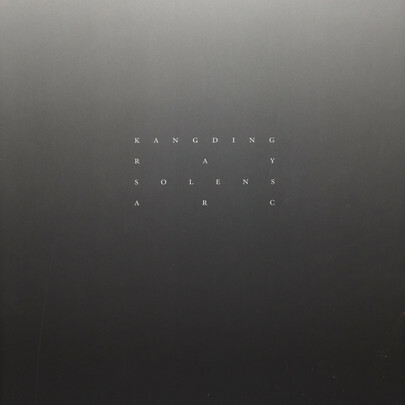 David Letellier, this is the real name of Kangding Ray, packs the album in an edition for 2 Lp, with three tracks for each of the four sides. The idea to realize a more dance-oriented music in place of a music for a solitary listening, does not say anything in respect of the global value of the twelve tracks; but at the same time we must also consider a certain boredom that takes over when we listen to this album sitting on a sofa, caused not so much by the repetitive rhythm – moreover it is structural – rather from the sound that often is reduced to the use of noisy deformations already listen by those who know the music of Kangding Ray; sound scrapes that often run through the entire musical work of the French composer and here are re-proposed with less involving effects if compared with other works. Beyond any consideration on sounds, though modeled on certain styles appears, however, abundant in terms of numbers, the element that emerges more strongly in Solens Arc is undoubtedly the rhythmic, capable to establish itself with a certain energy in both more techno tracks (such as Blank Empire or Amber Decay) or in a track with a more intimate character as History of Obscurity. After completing a first listen of Solens Arc, what is striking is the overall tone of the album, made up of aggressive accents inserted in contexts rather gloomy that sometimes reproduce certain stylistic elements of horror movie soundtracks (Crystal). Overall, it is an organic work, maybe too much when you consider the excessive uniformity of rhythmic and sounds. Does not seem a coincidence that none of the twelve tracks is able to break away for a greater impact than others. From a general point of view Solens Arc is not a bad album, but not even a work to be remembered compulsorily; and certainly it is an album that does not do justice to the potential that the French composer has been shown to have with the early works, achieved through a more structured, original and interesting writing. Solens Arc is an album where the music composition is expressed in a dignified manner, but pay the price of excessive repetition, not only internal, to which I have already mentioned, but also outside, in terms of its return to propose compositional and sound choices which have been made in Or and in different Ep and remixes published in the previous years. This is why the most interesting tracks of this album, therefore, appear to be those capable of balancing between coherence to the overall project of Solens Arc and the expression of a different personality, distinguished: History of Obscurity and Son are the songs that better manage this delicate balance. The adoption of slow times, a greater variation of the sound material and the replacement of conventional techno pulsation with a more articulated rhythmic writing are features that make these two tracks the most interesting of the entire album. Evento, however, is one of those tracks – of techno derivation – showing some element of greater interest than the rest.